Will 2016 Be Cummins' Worst Year Yet? 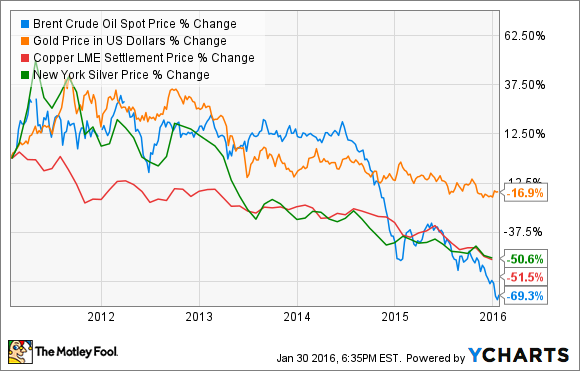 The turmoil in energy markets and broad declines in commodities don't bode well for Cummins. After a decade of steady growth, power systems specialist Cummins (NYSE:CMI) had a tough time adapting to the economic changes in 2015. International demand struggled, power generation demand fell because of the drop in commodities prices, and new products didn't fill the gap. Is 2016 setting up to be a better year, or will the pain continue for this engine maker? The under performance at Cummins has been driven by weakness in international and industrial markets. Mining and oil and gas extraction, in particular, have fallen off a cliff, and there's no reason to expect those industries will rebound anytime soon. You can see the prioce trajectories of some major commodities like oil, gold, silver, and copper have all turned south in the last five years, and that's caused investment in those industries to plunge. This dynamic is playing out more in international markets than here in the U.S., which is a big reason international sales are down. What's strange is the impact falling energy prices have had on the business in the past year. Lower energy prices may have a positive impact on things like transportation, but energy has fallen so far that it's starting to have a negative impact on the overall economy. The decline has spread to metals and chemicals, and to the labor market, dragging down more than just specific commodities. Not only do falling commodity prices hurt the industrial business, they are undermining some of the investments Cummins made in next-generation low emissions products as well. Cummins once expected natural gas engines to find a big niche in the commercial vehicle market, and it formed a partnership with Westport Innovations to develop them. But the decline in oil prices has made the cost advantage of natural gas disappear, leaving the natural gas transportation market stuck in the mud. The company has also developed emissions solutions, but they haven't taken off like Cummins had hoped. Demand may pick up if environmental regulations increase internationally, but today, countries are more focused on getting their economies back on track, so demand for its low-emission products hasn't been when management had hoped. Currently, 60% of Cummins' sales come from the U.S., and it looks like that business will be slow and steady in 2016. Unfortunately, international sales will likely struggle as long as mining and energy markets struggle. That will hurt power-generation demand, and a strong dollar will make its foreign sales look even weaker. 2015 wasn't a great year for Cummins, but I don't think 2016 is on track to be any better. Demand for its products is likely to be down broadly, and the decline in commodities prices will have a more pronounced impact on a power generation business that's already struggling. This may not be Cummins worst year yet, but its days of strong growth appear to be in the rearview mirror for now.